Barry M are really having a moment right now. 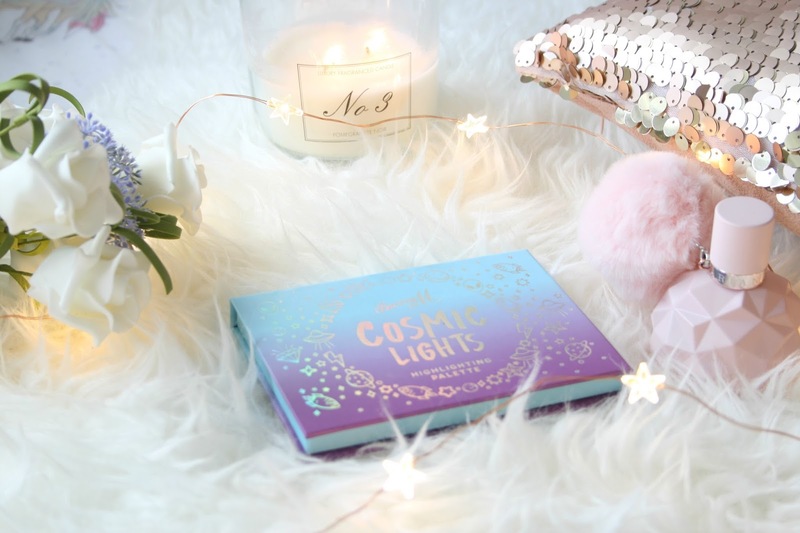 From their matte lipkits (post here), the Ready Set Smooth setting powder (featured here) and now the Cosmic Lights highlighting palette. While I feel like Barry M are sometimes put on the long finger when they come back with a bang they really do explode! As soon as I seen this highlighter palette I knew I just had to have it. So off I went with my card to treat myself (along with everything else I "treated" myself too). Starting with the packaging, I am obsessed, the writing is holographic so whatever way you move the palette the silver writing and doodles shine rainbow colours which is the prettiest thing ever. It's packaging itself is cardboard however it feels quite sturdy and the product inside seems to be well protected. It also has a huge mirror inside which is always great for makeup on the go. Inside there are four cream highlighters and two powder highlighters. 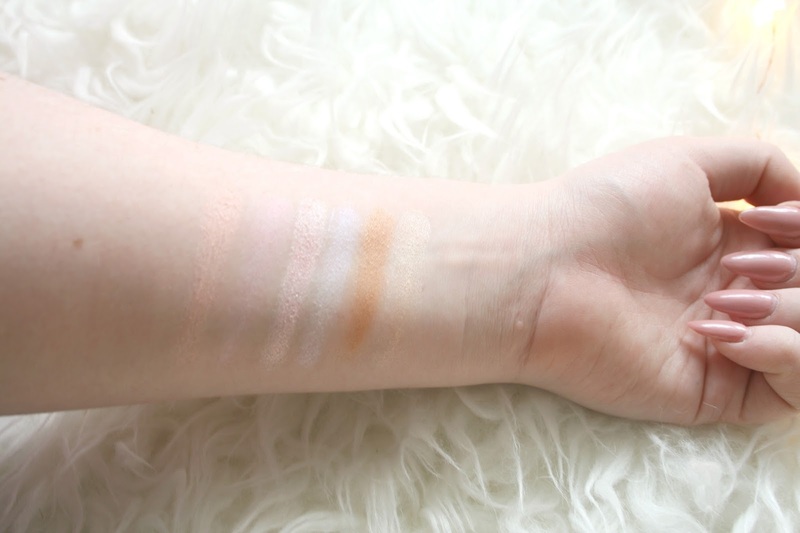 While I usually don't be a fan of cream highlighters I do really love the colours they've included in the palette. I will admit though I do prefer the powders to the cream but it's just my personal preference. However I have used and worn the cream ones too and they are just as gorgeous on the skin but I just find with powders you can achieve that blinding glow that everyone loves, whereas I find that more difficult to achieve with cream highlighters. Featuring a pale peach, a galactic looking purple, an irridescent pink, a blue toned white, a bronze and a banana shade. All equally gorgeous on as they are in the pan. I love that they added the purple one for something a little different as when it's on the skin it's nothing crazy but when it hits the light you just see the purple glow and I kinda love it. Although like I previously mentioned the powder formulas are my favourite specifically the top middle shade (in the palette). The irridescent pink shade (third swatch) is so blinding when you apply that I simply cannot get enough of it. It is so unbelievably blinding that when people asked what I was wearing they were actually shocked when I told them it was Barry M.
I think sometimes people under estimate Barry M's products but they're on such a roll right now i cannot wait to see what they bring out next! 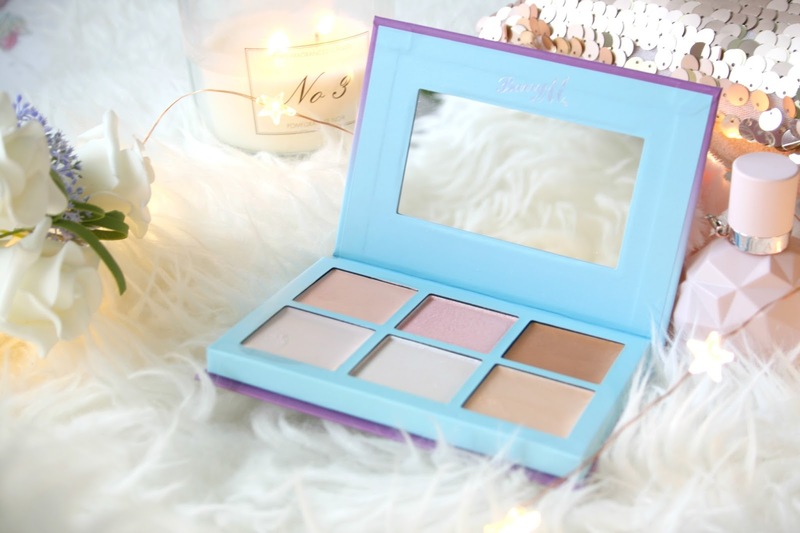 Have you tried Barry M's Highlighting palette yet? Had no idea that Barry M released any makeup products! If you don't mind disclosing, do you get these products free(for review purposes, of course! )when you don't mention you have purchased them ? Let me know if you can . I really wish there was more powders in this than creams because the shades are gorgeous!